MOSES BASKET. Portable and doesn’t take up much space. Can be placed on a stand right up by my bed. Available in a ton of shapes and sizes and price ranges. MINI CRIB. Since we aren’t going with the whole Sleepi System, we won’t be getting this mini crib either. But it is a great size and shape and has wheels so you can move it from room to room. There are also some other great mini cribs like this one available for those first few months. SWING. We borrowed a Fisher Price My Little Lamb swing from my friend Maggie when Alec was around four months old and would not take proper naps. It definitely helped. Say what you will about “motion sleep” I know several families who swear by the swing and it would not surprise me if we end up with one this time around. DAY BED. 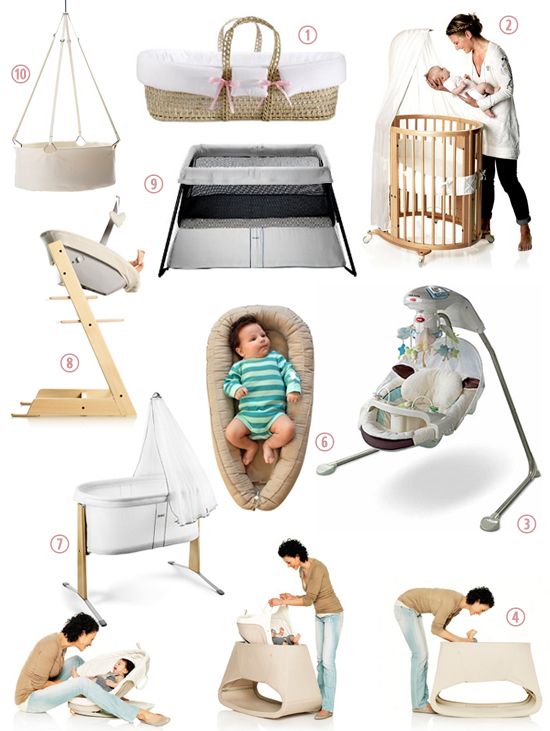 The Stokke Bounce’n Sleep looks like a good day bed option. Easy to move around the house, doesn’t take much space. Rockable. And has a bouncer option as well. We already have a Baby Björn bouncer that we liked, so the bouncer isn’t key for us. But this day bed could work quite well for naps and evening sleep in those first weeks and months. CRADLE. Baby Björn has just come out with its Harmony Cradle. A good first bed option that is easy to move around, has an attractive and functional design and provides sleep-inducing rocking and airy mesh sides. BABY NEST. With Baby A, the Baby Nest was one of our very favourite things for those first newborn months (as mentioned here and here). We used it as a co-sleeper in our bed at night. When we started using the crib, the Baby Nest made the huge space (which we of course couldn’t make cozier with a lot of stuff for safety reasons) a little more cosy for such a little baby. It also kept Alec in a good sleeping position on his back and helped prevent too much flat-headedness. We also used the Baby Nest for day sleeping on the sofa, on our bed, or wherever he ended up. And it worked well to keep him positioned and not rolling all over the place in the stroller bassinet. TRIPP TRAPP NEWBORN SET. Since our babies will be close in age, and the Tripp Trapp high chair has such a long lifespan, we will definitely be buying another Tripp Trapp for the new baby by the time he/she hits six months and starts solids. Since we will anyway be buying one, and since I am such a maniac about proper family dinners, I am wondering if we should just buy a second Tripp Trapp to have from the start. We can use it with the newborn set so that the new baby can be a part of family dinners from the beginning. And so that I have a good safe place to lay the little one down when I’m in the kitchen. With Alec, we used a bouncy chair for this, but with everything that goes on in our kitchen these days, I think it’s a better idea to have a safer place to put baby higher up. TRAVEL COT. Not to forget when looking at smaller crib options for those first few months – we already have a good little crib, our Baby Björn Travel Cot Light, that we could use in our bedroom. It’s light and easy to set-up and dismantle. It’s small. And we already have one (and we really love it – see here, here and here). HANGING CRADLE. This one by Leander can be hung from a stand or from a wall mounted hook. Do you have a “secondary” crib? Where does your little one sleep during the day?